In the 1870s, when the population of the town grew from 5938 to 7737, the character of Sutton Coldfield was changing from rural to urban. This was also a decade of change for the Parish Church of the town, changes prompted partly by the desire to modernise and embellish the building to suit the taste of the burgeoning urban middle class, and partly by the need to accommodate a larger congregation. The Parish Church of Holy Trinity was no longer serving the whole of Sutton, as new parishes of Walmley, Hill and Boldmere had been established in the 1850s. This diminution in the size of its parish gave the opportunity to reassess the Church, which was extensively repaired in 1863, with a new pitched roof to the nave. There were more alterations in 1869 with the removal of some of the galleries and the restoration of the south porch. Embellishment of the church began with the installation of stained glass windows, contributed by wealthy parishioners, most notably the Bishops Window in the Vesey Chapel, representing four bishops with Sutton connections, erected in 1870. The Vesey Chapel was further improved in 1875, when the Vesey monument was moved to its present position above his grave - the grave was examined at this time, and found to contain only a few scattered bones, including the jaw-bone of a very old man. 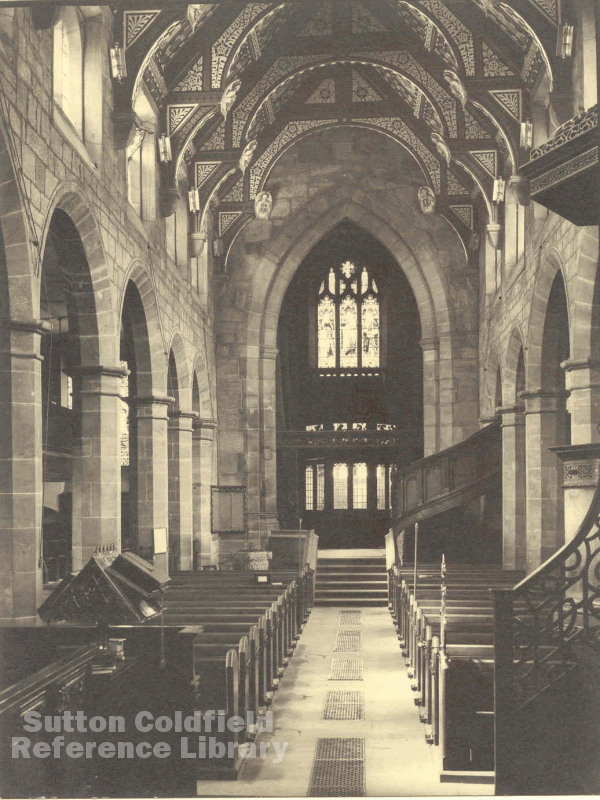 Also in 1875 the chancel floor was raised, and the choir stalls and parclose were inserted. These were made of Jacobean carved oak dating from 1618, adapted from part of the old choir and organ loft which had been removed from Worcester Cathedral when it was restored in 1870. (Sutton Parish was transferred from the Diocese of Lichfield to Worcester Diocese in 1837, and to Birmingham in 1905). For the first time since Bishop Vesey added the two aisles c.1530, the church was extended, first by the Clergy Vestry in 1874, then more drastically in 1879. Increasing population, and the removal of the galleries ten years earlier, meant that extra accommodation was required, and this need was met by the construction of the new north aisle with its gallery, and benches replaced the remaining box pews, altogether increasing the seating capacity by 200 places. (The box pews in the Georgian south gallery are still there today). Minor changes and improvements have occurred over the subsequent 135 years, but now sweeping changes to the building are proposed to adapt it to the twenty-first century; the Parish Council has been granted a faculty, and it only remains to raise the finance for work to begin.